Imagine a world where a costumed vigilante saved one of the World Trade Center towers and how the people of New York not only turn him into a super hero, but also their mayor. I don’t normally like super hero books. The only time I can really get into them is if they’re a different take on a super hero. Probably my favorite “super hero” series was Top Ten which was basically the Justice League meets NYPD Blue. It was about a world where a super hero police department was created to police super heroes. Powers is sort of the same idea, and another fine book. I was resistant to jump into Ex Machina. It’s part super hero book, part political thriller. It’s Superman meets the West Wing! Comedian Jackie Kashian has turned me onto a handful of comics in the past and has yet to steer me wrong. Awhile back she introduced me to Y: The Last Man written by Brian K. Vaughan. Y was on the short list of books that actually brought me to tears. Oddly enough, just talking about Y in a bookstore recently with my friend Jeff nearly did the same thing again! So while I wasn’t initially interested in reading Ex Machina, which I dismissed as Supermayor, I decided to give it a shot based on Vaughan’s writing and Kashian’s recommendation. I was blown away right from theget go. The storylines bounce back and forth nicely between mayoral duties and super feats. The lead character Mayor Mitchell Hundred isn’t stiff and boring, he’s impulsive, imperfect, witty and fun. He makes me feel like how I imagine I’d handle suddenly becoming mayor based on celebrity status as opposed to genuine qualifications. He never does what’s right politically, he always does what’s right as a human…and fortunately it seems to just about always work out in his favor. Mitchell’s best friend and head of security Rick Bradbury is loyal and devoted. He’s exactly the guy you’d want having your back. The rest of the mayoral staff from Deputy Mayor Dave Wylie to Journal and January Moore are just full rich characters. 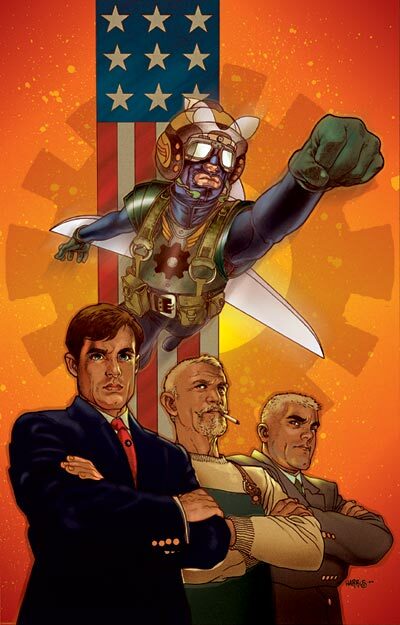 By the end of the series, I ended up much more involved in the politics of the book than the present day super stuff. That’s the only complaint I have with the book. I jumped in because Vaughan said right from the start that it was a finite series. It was covering Hundred’s term in office and that was it. While I loved the flashbacks showing Hundred’s adventures…well…misadventures as The Great Machine, a lot of the present day Great Machine action didn’t hook me too much. I can’t really say more without giving away big spoilers. Vaughan writes comic books like operas. I’ve read three of his books and each one ends on kind of a downer. I love that. Pride of Baghdad…there’s another Vaughan tear-jerker! If you haven’t guessed, I don’t write these things out in advance. I try to write as coherently as possible and keep it some sort of sensical thought. The point is, I love Vaughan’s work. Tony Harris’ art is crisp and dynamic. I love the artists like him and Alex Ross who use real life models in order to create realistic shots that make you feel like you’re reading a movie. You never see something on the page that couldn’t be captured with a camera in real life. I think that helps ground the book in reality. It really is a great series. If you’re a comic reader and you haven’t checked out Ex Machina yet, I really hope you do. It’s not a long series. It’s 50 issues collected in 10 Trade Paperbacks. The politics aren’t daunting or overwhelming at all. They’re very accessible. Like a Ramones song, this book is short enough to leave you wanting more! Posted on February 5, 2011, in Reviews and tagged brian k. vaughn, Comedian, comedy, ex machina, mike bobbitt, off the mike, tony harris. Bookmark the permalink. Leave a comment.